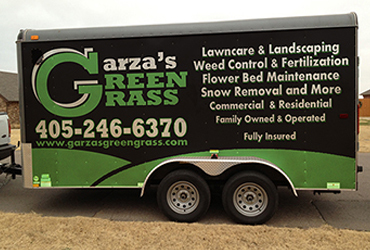 Garza's Green Grass L.L.C is a family owned and operated lawncare and landscaping company. With over 20 years experience, we provide services to the greater Oklahoma City metro area and the Lawton surrounding areas. We are dedicated to providing exceptional, detailed work for our clients. We specialize in residential and commercial lawncare service and custom landscaping. Garza's Green Grass is very flexible and will tailor our services to fit your needs. Garza’s Green Grass is fully insured, licensed, and accredited by the Better Business Bureau of Central Oklahoma. We also have numerous references available upon request. If you’re looking for a reliable lawn care company that cares about the appearance of your lawn as much as you do, give us a call for a free estimate. Garza’s Green Grass is fully insured, licensed, and accredited by the Better Business Bureau of Central Oklahoma. Give us a call for a free estimate. 2016 © Garza's Green Grass. Powered by Spunky Monkey Media.